Rather than write an eighth Harry Potter novel, J.K. Rowling teamed up with playwright Jack Thorne and director John Tiffany to create this two part, four act play. The full team came up with the plot. Thorne wrote the script, which in a number of places obviously borrows Rowling’s dialogue. This is a very long play. Together, the two parts run a bit over five hours, so splitting them up makes perfect sense. Currently running at the Palace Theatre in London’s West End, both parts are presented on days with matinee performances, while days with only a single evening performance present the full play over consecutive nights. The blurb says this takes place 19 years after the events in Harry Potter and the Deathly Hallows, which is really true only of the opening scenes. The full story is spread out over a four-year period. The most important characters are really the children, particularly Albus Severus Potter, youngest son of Harry and Ginny, and Scorpius Malfoy, Draco’s son. 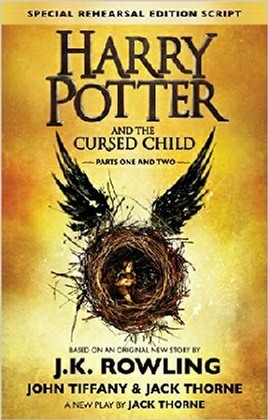 Unlike Harry and Draco, who hated each other at school and are now, for the most part, still only grudgingly civil, the two boys strike up an immediate friendship on the Hogwarts Express, and both end up being sorted into Slitherin (gasps of horror from Griffindor fans), much to the annoyance of Rose Granger-Weasley, Ron and Hermione’s daughter. The plot involves a good bit of time travel, with alternate timelines emerging, and in at least one of which Albus doesn’t exist because Voldemort won. In the base timeline, Harry is head of Magical Law Enforcement, and Hermione, perhaps unsurprisingly, has become Minister for Magic. Other timelines find Hermione either a fugitive, or teaching at Hogwarts, with no Rose and Ron married to one of the Patil twins. Complicating things in the base timeline is a suspicion that Scorpius is actually Voldemort’s son, not Draco’s, a rumour that’s obviously annoying the hell out of Draco and doesn’t make Scorpius very happy, either. Naturally enough, as in any time travel story, the actual travelers always remain aware of their original selves, even though no one around them realizes anything has changed. I think it’s important to emphasize that this is the published script of a stage play and not a novel. Legions of fans seemed to think they’d be getting the latter, despite months of publicity making it perfectly clear it was a script. Yes, scripts are a little harder to read than novels. There’s almost no description of settings, and magical effects are given only the briefest description. These are things that will be created in a concrete form on stage, and the actors don’t really care about what the sets will look like, or how illusions will be performed, so long as the sets are built and the illusions work. As in any stage play, dialogue is what matters. That may, in fact, be a big part of the problem for many fans. Everyone talks a lot but you have to imagine just what they’re doing. One should also emphasize that this is the script as it existed at the beginning of previews, nearly two months before the play opened. New plays undergo a long rehearsal and preview process with the intention of seeing what works and what doesn’t, and fixing or removing the latter. Books, on the other hand, require time to set in type, print, and distribute. Particularly with print runs in the millions. A final version of the script is planned for 2017. It will be interesting to compare the two then, and see just how much the script was changed before the show opened. The play, incidentally, has received excellent reviews in the London press, so apparently it works just fine on stage. One problem with any printed script is that the reader has to imagine what the actors will do, and often the reader’s imagination isn’t up to it. Particularly in a play such as this, which relies heavily on swift scene changes, complex effects, and carefully contrived lighting.